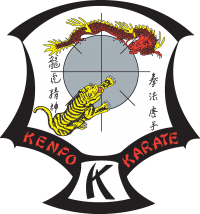 The very 1st Kenpo School was established in Jersey by an Irish Black Belt named Maurice Mahon circa 1967/8, who opened a club in Undercliff Road. The club was handed over to Jack Skelton a Black Belt from Dublin when Maurice returned home. When Jack also left the Island the running of the club became the responsibility of Irish Brown Belt Don Cassidy. At this point the club was based at St Johns Rectory Hall. Soon after Don took over the club it moved to Caldwell Hall in St Clements. Don Cassidy also left the Island at which point the reins of the JKK where handed to Roy Macdonald, Mick Carre and John Jacklin. Mick Carre stopped training leaving Roy and John to continue the JKK. During this period Maurice Mahon, Don Cassidy and other Irish Black Belts travelled to Jersey to test all students as Roy and John were Brown Belts. To improve their knowledge and standard of Kenpo Roy and John travelled to The USA to meet and train with Larry Tatum. Whilst in the US Roy and John were tested for 2nd Brown by Larry Tatum. At this test were many now big names in the Kenpo world including Dian Tanaka, Steve Sanders and Ernie George. Some time after their return from the US news of their test reached the Irish Instructors, who were upset at the promotion and asked Roy and John to remove the 2nd Brown, Black Tip from their belts. John complied with the request, but Roy refused out of respect for Larry Tatum who had given him the promotion. At this point Roy and John went their separate ways with John directly linking with the Irish in Dublin, Roy linking with the IKKA and Mr. Parker in the US. 95% of the JKK membership went with Roy Macdonald including Purple Belts Graham Lelliot, Dave Williams and Jim Rennie. John Jacklyn and his group carried on for 6 months but then stopped training. The JKK under Roy continued to expand; its venues included The Glass Church, The Lido de France, St Lukes Church Hall, Seaton Youth Centre and Hautlieu School. Roy was asked to teach a daily (afternoon) self defence class at Quennevais School as an extra school activity. The school were delighted with the course and when Roy approached them about hiring the schools gym for the JKK they were more than happy to hire it out to “him”, this was the birth of the Le Quennevais Club. Le Quennevais was the fourth club that Roy had established and was running for the JKK. The busy weekly schedule of teaching and travelling between four clubs became very time consuming, so Roy asked one of the Brown Belts Graham Lelliot if he would assist him at the Quennevais Club. This arrangement eased the pressure and allowed Roy to develop the JKK in St Helier consolidating the town clubs into Georges Gym and then later at Aquila Youth Centre. Roy continued to teach at Le Quennevais with Graham assisting him, but as time went on Roy found it was only necessary for him to visit Le Quennevais on a fortnightly basis, which he did religiously for nearly 15 years. Around this time Fort Regent were developing facilities to cater for organised groups, this is when the JKK initially moved to “The Fort”. Kenpo was the largest group of karate practitioners in Jersey, this meant that they could afford to bring over the top instructors; this of course included SGM Ed Parker who visited 20 times. Roy Macdonald who was the highest officially recognised Kenpo Black belt not only in Jersey but also in Europe, was also chief instructor of the JKK. The JKK had become a very large and successful group, but a price for that success was about to be paid. A section of the JKK decided that that they wished to travel their own path and split away from the JKK to form their own organisation The CIKKF this group flourished for a while and then fragmented into 3 or 4 smaller separate groups. The JKK still with Mr. Macdonald at its head moved into 2 fully equipped, full time Dojos at Fort Regent, these premises finally gave Kenpo a permanent home “The Kenpo Centre of Excellence”. Soon after it was decided to close all satellite schools and centralise everything at The Fort. Since moving to the Fort the JKK has gone on from strength to strength, always learning from the past, living in the present and preparing for the future.